RandomPatches is a mod that contains a bunch of miscellaneous patches for Minecraft. RandomPatches only contains features that require ASM transformers. Tweaks that don't require ASM transformers go in RandomTweaks, which I recommend as a companion mod. This also sets the "fml.readTimeout" and "fml.loginTimeout" system properties. This can be configured and take effect in-game, unless you set "patchTitleScreenOnDisconnect" to false. On Minecraft 1.9 and higher, this removes the rubber banding and the "<Player> moved too quickly!" log spam that occurs when players move too fast. These limits can be configured and take effect in-game, unless the NetHandlerPlayServer patches are disabled in the configuration. This is similar to Rebind Narrator, but RandomPatches' version is slightly more consistent with vanilla behavior. This feature disables itself when Rebind Narrator or ReBind is installed. This feature only works on 1.11 and above and is completely client-sided. 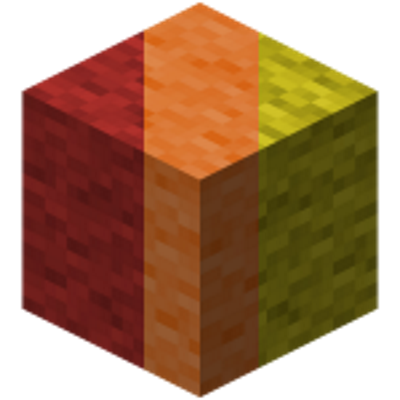 I am aware that on 1.13 and above, End portals use obsidian's break particle textures. However, I think the ones I'm using now look better. Although RandomPatches' fix is slightly more mod-compatible in theory, it disables itself when VanillaFix is installed. This is a better implementation of the Buoyant Boats tweak in CplPibald's Tweaks. The buoyancy of boats under flowing water can be configured. Unlike CplPibald's Tweaks, which creates a custom boat entity, RandomPatches works by patching the EntityBoat class, which makes this feature work with vanilla clients connecting to servers withthis mod installed. In vanilla Minecraft, entities' bounding boxes are recalculated every time they are created. This is not always accurate, which can lead to entities suffocating. RandomPatches fixes this by storing entities' relative bounding boxes (in a tag list called RelativeAABB) and restoring them when they are created. This feature works if only installed on the server, but is limited. This feature does not work if it is only installed on the client. This is a fix for MC-11944 on Minecraft 1.9 and higher, which allows players to replace End portals, End gateways and Nether portals with buckets. By default, this fix is disabled for Nether portals to allow for toggleable Nether portals. This loads much earlier than and will override It's the little things' version. The title and icon are configurable in-game, and are set to the vanilla title and icon by default. On Minecraft 1.10 and higher, /rpreload reloads the server-sided configuration and /rpreloadclient reloads the client-sided configuration (which are the same thing in a singleplayer world). Many options can be changed through the in-game configuration GUI, which now works on all supported versions of Minecraft, and many also take effect in-game. Does this work with 1.13.2 Servers? No, I haven't ported it yet. Any plan to bring this to 1.13.2? Yes, hopefully by the end of this week. I've been having trouble setting up a Forge 1.13 workspace, so there will most likely be some delay. Yes, that's what I originally wrote this mod for. Does the host only has to install this mod to their server or do I also have to install it? This mod has both server-sided and client-sided functionality, but I'm assuming you're only using this for the read and login timeouts, for which the mod only has to be installed on the server. yeah mostly for the timeouts. Now I asked the host to install this but he doesn't know how. Download it and put it into the mods folder. Hey, thanks for creating the timeout fix, it didn't save me 5 days of looking for a fix but it sure is the best way to fix it. Thanks! Do you notice any actual change in latency? It's possible that the way I implemented the patch screwed up the ping calculations. Yes it was definitely noticeable and seems to be worse with players that have higher latency. I have quite a few mods and some FPS (performance) improving mods installed and that could be causing a conflict with your mod. But it was only after I added random patches. before that when the players were able to log in the latency was fine was just the login problem. Any mods I should avoid when using yours? All RandomPatches does is change the read/login timeout and the KeepAlive packet interval; it shouldn't affect latency at all. Can you confirm that the issue goes away when RandomPatches is removed? Unfortunately I tried again and I can't connect to the server without it due to the amount of mods i'm running. they were lucky moments when I did connect before adding your mod to begin with. i'm just happy with being able to play my pack with friends regardless of latency. It might have been there the whole time but I never was on the server long enough to test it without your mod as it would boot me out but, it might just be due to the amount of power the server requires to process a tick and causes it to delay in processing the networking thread. Don't know why I was not able to connect after removing you mod and restoring my pack to the way it was before but whatevs. Is KeepAlive related to actual player deaths or just for back end networking? Thanks for your help, I know there is only so much we can do since the majority of Minecraft is still single threaded with only trace bits being multi thread. Great job! you get an A+ for support and snappy replies!! KeepAlive packets are used for ping calculations and to make sure that clients are still connected. If you haven't learned Java already, I highly recommend becoming comfortable with it first. I'm probably not the right person to ping thoughts and questions off of since my specialty is QoL mods. How do you add this to a server? You download the version you want, then put it into the mods folder in the server directory.